Money-Kyrie К Е. Normal counter-transference and some of its deviations // International Journal of Psycho Analysis. 1956.V. 37. P. 360-366; also reprinted in The Collected Papers of Roger Money-Kyrie, 1978 / Ed. D. Meitzer with the assistance of р. 0'Shaughnessy, Strathtay, Perthshire: Clunie Press; reprinted also in Е. Bott Spillius (ed.). Меlаше Klein Today. Mainly Practice. London: Routledge, 1988. 'К 2. P. 22 — 33. Ogden Т. On projective identification // International Journal of Psycho Analysis. 1979.V. 60. P. 357-373. Ogden Т. Projective Identification and Psychotherapeutic Technique. New York: Jason Aronson, 1982.
of Psycho Analysis. 1983.V. 64. P. 281-289; also in Е. Bott Spillius (ed.). Меlаше К1е1п Today. Mainly Practice. London: Routledge, 1988.V. 2. P. 138-151; Enclaves and excursions. Unpublished paper given to the British Psycho-Analytical Society, 1989. Pick Е Brenman. Working through in the counter-transference // International Journal of Psycho Analysis. 1985.V. 66. P. 157-166; also in Е. Bott Spillius (ес1.). Меlаше Klein Today. Mainly Practice. London: Routledge, 1988. V. 2. P. 34 — 47. Rey Н. Schizoid phenomena in the borderline, inj. Le Boit and А. Саррош (eds). Advances in the Psychotherapy of the Borderline Patient. New York: Jason Aronson, 1979. P. 449-484; also in Е. Bott Spillius (ed.). Меlаше Klein Today. Mainly Theory. London: Rout- ledge, 1988. V. 1. P. 203-229.
in à woman seen as à defence against à psychotic breakdown // Е. Bott Spillius (ed.). Меlаше Klein Today. Mainly Practice, London: Routledge, 1988. V, 2. 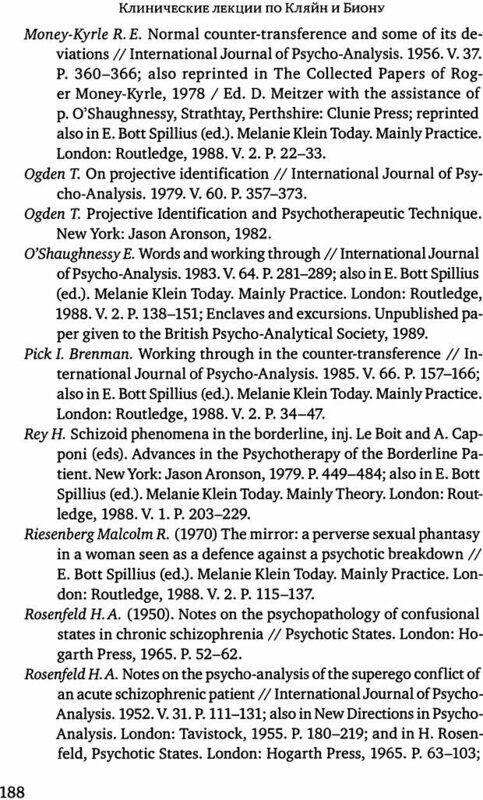 P. 115 — 137.
states in chronic schizophrenia // Psychotic States. London: Hogarth Press, 1965, P. 52-62. Глава 2. Психологические законы снов5. Сны о школе почти всегда носят оттенок кошмара. Однако их повторяемость (порой в течение всей жизни) говорит о том, что надо учиться забывать старые обиды и унижения, учиться прощать. Глава пятая. 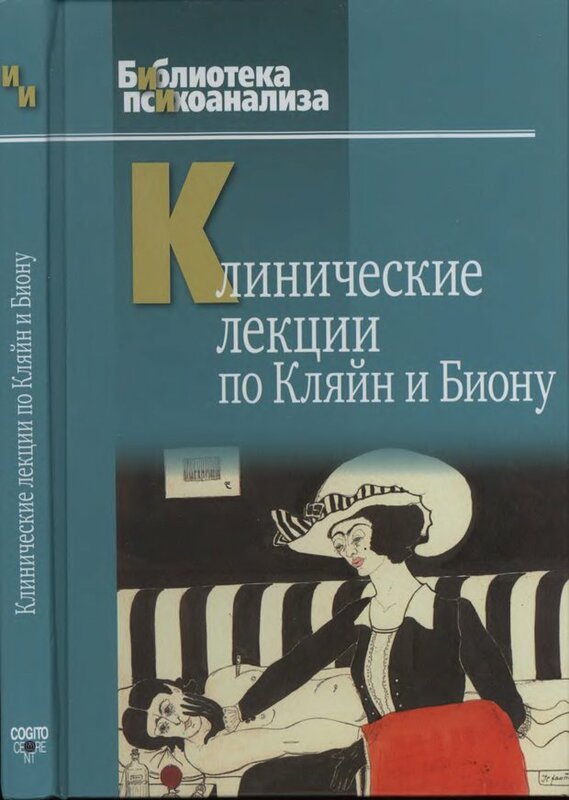 ЛЕКАРСТВЕННЫЕ СРЕДСТВА9) Сомневающиеся могут почитать книгу «Средство от вегетососудистой дистонии», вышедшую в серии «Экспресс-консультация». ГЛАВА IX. Мумия в мавзолееИ. Пыляев свидетельствует: «В старину существовал еще остаток язычества, который, кажется, у некоторых купцов в Петербурге существует посейчас. В рот умершего кладут мелкие деньги, будто бы для издержек в дальней дороге».